Black walnut belongs to a group of deciduous trees in the walnut family (Juglandaceae). 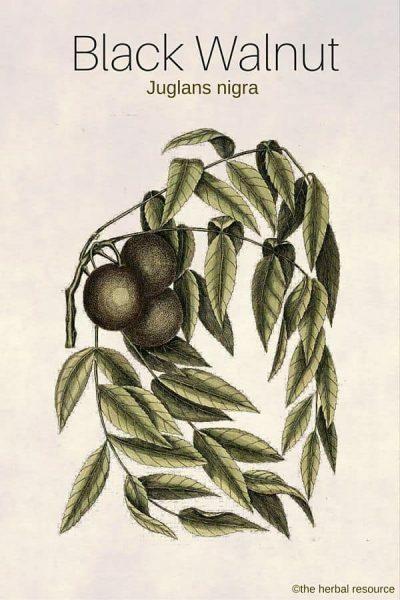 Even though it is mostly valued for its dark brown, finely-grained wood and the unique and pleasant taste of the fruits, it also has a long history of medicinal use. The Native Americans were aware of the medicinal properties of the tree and used in a variety of ways but mainly for its antiparasitic effect. The medicinal effects of black walnut are very similar of the closely related spices English walnut (Juglans regia). 1 What is Black Walnut Used For? The tannins in the hulls are regarded to be antibacterial, anticancer, antidiarrheic, anti-hepatoxic, chelator, antihypertensive, antitumor, cancer preventive and antiulcer. The substance iodine is regarded to have an antiseptic and antibacterial effect. The bark and leaves of the black walnut are viewed as alterative, anodyne, astringent, blood tonic, detergent, emetic, laxative, pectoral and vermifuge. The nuts of the black walnut are believed to aid in decreasing cholesterol levels and to improve overall heart health and function. Also, the presence of omega-3 fatty acids in the fruit of the black walnut may help to reduce inflammation and promote the function of the lungs which in turn might be beneficial for ailments relates to the respiratory system such as asthma. Black walnut is regarded to be useful in the treatment of skin diseases such as herpes and eczema. Traditionally it is used as a natural remedy for acne, canker sores, psoriasis, and other fungal infections. Externally it has also been used for skin complaints such as jock itch, dermatitis, ringworm, athlete’s foot, blisters, scabbing pruritus, varicose ulcers, and even syphilis sores. Studies have shown that juglone, one of the active substances in black walnut has anticancer properties. It was showed to be toxic (cytotoxic) to cancer cells by both apoptosis (a form of programmed cell death that occurs in multicellular organisms) and necrosis (death of most or all of the cells in an organ or tissue). The juice of the fruit husk may be applied externally as a treatment for ringworm or used as a poultice for inflammations. The oil from the ripe nuts is a traditional remedy for gangrene, leprosy, and wounds. Black walnut is believed to be beneficial as a remedy for poor digestion or diarrhea. It has been used as a natural laxative and is considered to be helpful for cleaning the intestinal tract. Furthermore, black walnut is used in traditional herbal medicine to expel worms, parasites and harmful pathogens from the body. It is suggested that the natural tannins present in black walnut alter the pH of the intestine which may help in killing fungus, parasites, and yeast, and expel worms and parasites. The most important active substances in black walnut are juglone (5-hydroxy-1,4-naphthalenedione), tannins (galloyglucose and ellagitannins), and iodine. Other ingredients in the black walnut hull include omega-3 fatty acids, vitamin C and beta-carotene. B1, B2, and B6 are found in the leaves. It is mainly the outer covering of the nut (the hull) that is used in herbal medicine, but the bark, whole nut, and leaves have also been used. Commercially available tablets or capsules usually contain around 500 mg – 1000 mg of powdered black walnut. The oral doses are generally taken three times a day but no longer than six weeks because of the high tannin content of black walnut. Otherwise, the manufacturer’s instructions should be followed carefully. In rare cases, black walnut may cause rashes, swollen skin, hives, and skin irritation. 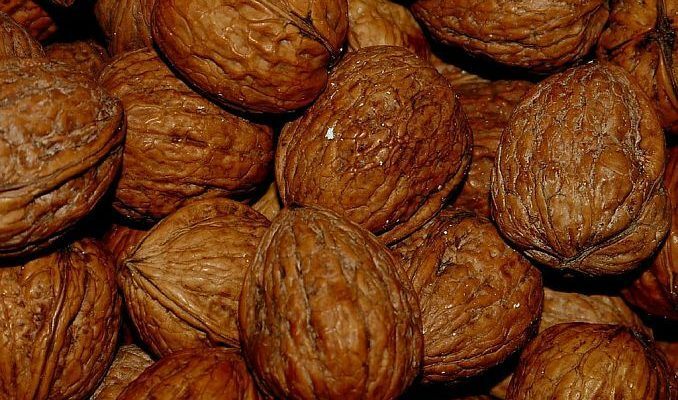 Rarely, chest pain, tightness of the airways, and breathing difficulties have been associated with the use of black walnut. 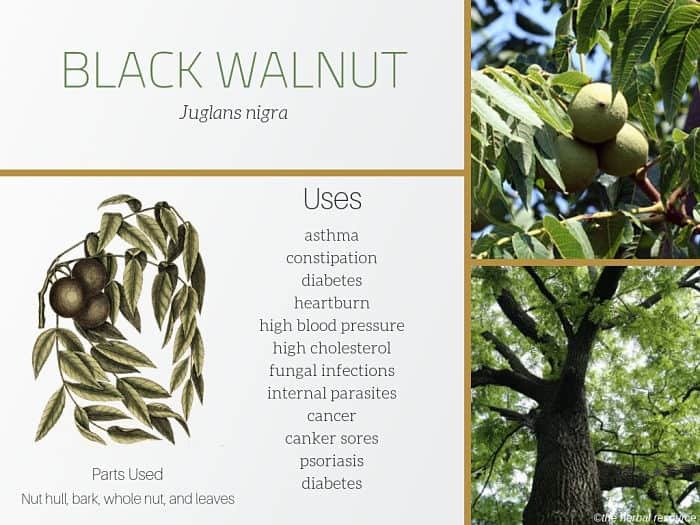 Black walnut is not advised for use during pregnancy or while breastfeeding due to lack of information. It may interact with certain medications, so a healthcare professional should be consulted regarding medicines, vitamins or other herbs before use. As with all herbs and supplements, it is vital that they are purchased from a reputable source to ensure the product is of high quality. Black walnut is a deciduous hardwood tree native to North America, prized for its beautiful dark-colored heartwood. 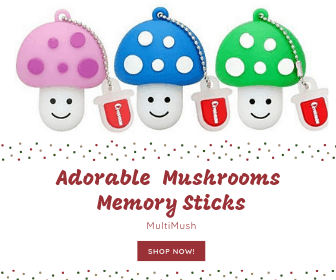 It grows in small groups or as scattered individuals in the fertile, moist soils of mixed hardwood forest. It can also be found in pastures, meadows, and slopes. Its natural range extends from western Vermont and Massachusetts west to eastern South Dakota; south to Texas and Florida. Black walnut does well in a range of soil conditions, from light (sandy), medium (loamy) and heavy (clay) soils that range from acid, neutral to basic (alkaline). Black walnut is a large tree that grows to a height of 150 feet with a trunk diameter of up to 5 feet. Its crown is broadly rounded; the trunk is straight and columnar, not buttressed at the base, with thick, deeply furrowed black bark. Twigs are stout, greenish to orange-brown, hairy, smooth and gray with brown pith divided by chambered partitions. Only the black walnut and a close relative, the butternut, have chambered pith. The buds are somewhat rounded at the tip, soft, pale brown, up to ½ inch long. The leaves are alternate, pinnate compound with 15-23 leaflets up to 31/2 inch wide. The leaflets are broadly lance-shaped, pointed at the tip, rounded at the asymmetrical base and toothed along the edges. They are yellow-green and smooth on the upper surface, paler and hairy on the lower surface, turning yellow in the autumn. The several staminate flowers form a thick, yellow-green hairy catkin. The monoecious flowers are either male or female, but both sexes can be found on the same tree. The flowers are wind-pollinated, and the tree is self-fertile. The flowers appear in May and June when the leaves are partly grown. The pistillate are much fewer in small spikes; neither flower has petals. The seeds ripen in October, growing up to 2 inches in diameter in groups of 1 or 2. They are spherical, green or yellow-green, slightly roughened with a thick husk covering the hard, oval dark brown deeply ridged nut. Meyer, Clarence: American Folk Medicine. Glenwood, Illinois. Meyerbooks 1973. Meyer, Clarence: Planetary Herbology. Glenwood, Illinois. Meyerbooks 1992. Forey, Pamela and Ruth Lindsa: An Instant Guide to Medicinal Plants. Crescent Books 1992. Hylton, William H: The Rodale Herb Book: How to Use, Grow, and Buy Nature’s Miracle Plants. Rodale Press, Inc 1974. Ody, Penelope: The Complete Medicinal Herbal. 232 Madison Avenue, New York. Dorling Kindersley, Inc 1993.